Walk through our setup tutorial: adding your home entertainment devices, home control devices, setting up one-touch Activities and learning more about the usage of your remote. Already set up and something's not working? Our troubleshooters and support articles will help set things right. Harmony Hub is the center of your home entertainment and home control solution. Placed near your television, cable/satellite box, game console and other equipment, it uses Infrared (IR), Bluetooth and Wi‑Fi to control your various devices. Connect a power adapter to your Harmony hub. 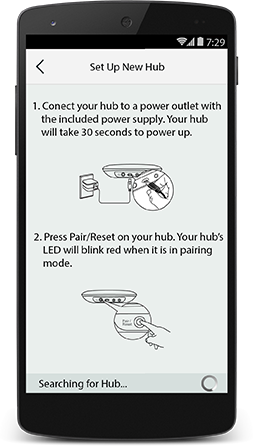 It takes 30 seconds for the hub to power on. The IR mini blasters connect to the back of the hub and helps extend the coverage area for IR controlled devices. Use this if your entertainment system has closed cabinets and you have devices behind cabinet doors. Use of the IR mini blaster may or may not be required, depending on your setup. If your mobile device doesn't support Bluetooth LE technology, the USB cable can connect Harmony Hub to your computer so your homes Wi‑Fi credentials may be saved to the hub. Harmony Hub uses Wi‑Fi to communicate with the Harmony mobile app which is used for both setup and additional control. 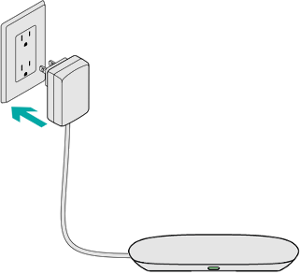 Use of the USB cable may or may not be required, depending on your setup. Position Harmony Hub on top of your cabinet, or on a large, open shelf that's unobstructed. 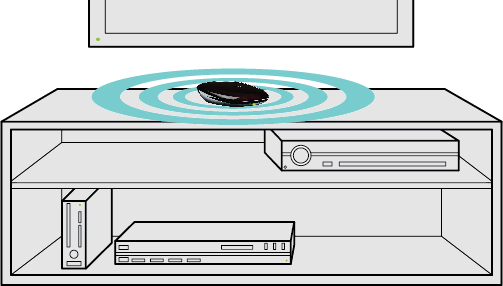 IR signals sent from the hub will reflect off of walls and other surfaces before reaching your devices. Direct line of sight is generally not required. Position Harmony Hub inside the cabinet, on or beside the majority of your devices. 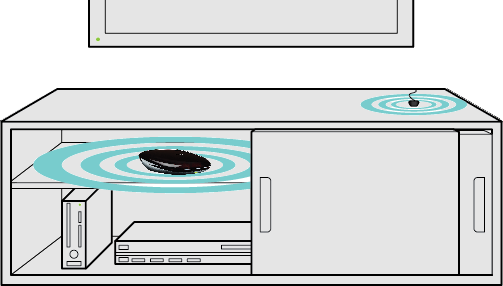 IR signals sent from the hub will reflect off of walls, cabinet interiors and other surfaces before reaching your devices. Direct line of sight is generally not required. Plug the IR mini blaster into the back of the hub and position it on top of your cabinet so it may send IR signals to your television. Plug the supplied power adapter into Harmony Hub. The hub takes 30 seconds to power on. Visit the iTunes App Store or Google Play and search for the Harmony app. Prefer the MyHarmony desktop software? The Harmony app should find your hub after several seconds. The Harmony app is unable to discover Harmony Hub. You'll be guided through several screens explaining how Harmony Hub works. If you have a previous Harmony remote and would like to import its devices and Activities, you will be able to copy them over to your new Harmony Hub. If you do not have a previous Harmony remote, select No, Set Up New. Harmony will first try to detect some of your connected devices such as Sonos, Roku and Philips hue. 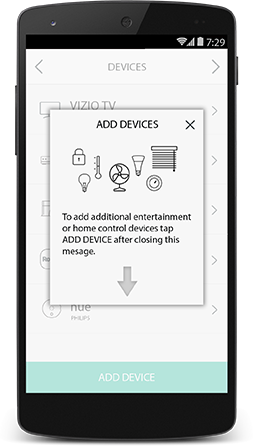 Press the Add Device button at the bottom of your screen to add additional home entertainment and home automation devices. If required, Harmony will ask you to enter the username and password for some of your services so we may communicate with them. You'll now be able to configure up to 50 Favorite TV Channels. Enter your zip code to help find local service providers, then select from a pre-populated list of channels. Add up to 50 Favorite Channels to the Harmony mobile app. Learn more about Adding Favorite Channels. Unlike other universal remotes that may control devices individually, Harmony controls an Activity such as Watching TV or Playing a Game. You don't need to choose which device you want to control. Start your Watch TV Activity and your volume will automatically control the stereo, and channels will automatically change your TV or cable/satellite box. Watch this video to learn more. To help keep your Harmony in sync with your devices, avoid turning your television, cable/satellite box and other devices on and off manually or by using their original remote control. If something didn't turn on then use the help feature available from within the Harmony mobile app. Having trouble with one of your Activities? If one of your devices didn't power on or change to the correct input, then we recommend using our Activity troubleshooter to help narrow down the problem and find a solution. Using the Harmony Help feature to fix a problem with your Activity Your Harmony has a Help feature which can assist in correcting problems when starting or stopping an Activity.